Series of drawings, pencil on paper, dimensions variable. For most visitors to Wales a first encounter with the language typically comes in the form of road signs, which since the 1960s have been bilingual. In fact, a new regulation introduced in 2016 stipulates that all new road signs should not only be bilingual, but must give the Welsh text first, followed by the English. Admirable in its efforts to preserve the uniqueness of the language, culture and identity of Wales, the regulation unfortunately doesn’t take into account the significant percentage of the population who don’t speak any Welsh at all. The issue was brought to light in 2008 when a signage company emailed the English text for a sign banning lorries from a road near a supermarket in Swansea (“No entry for heavy goods vehicles. Residential vehicles only”) to its in-house translation department. The translation received in reply (“Nid wyf yn y swyddfa ar hyn o bryd. Anfonwch unrhyw waith i’w gyfieithu”) was promptly printed and the sign erected. It wasn’t until bemused Welsh-speaking members of the public began noticing that the sign now read “I’m not in the office at the moment. Send any work to be translated,” that the sign-makers realised their error. 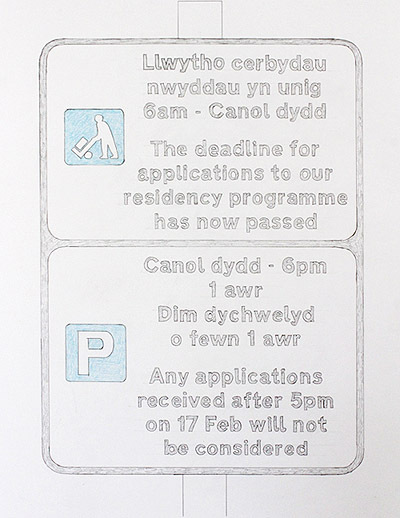 The Dragon’s Tongue imagines the situation in reverse: the drawings present proposals for signs in which the Welsh text gives straightforward instructions to travellers, whilst the emailed English translation veers off into a different realm of experience altogether.